A grounded fishing boat in Santa Cruz released about 200 gallons of diesel into the water Monday morning, according to the U.S. Coast Guard. 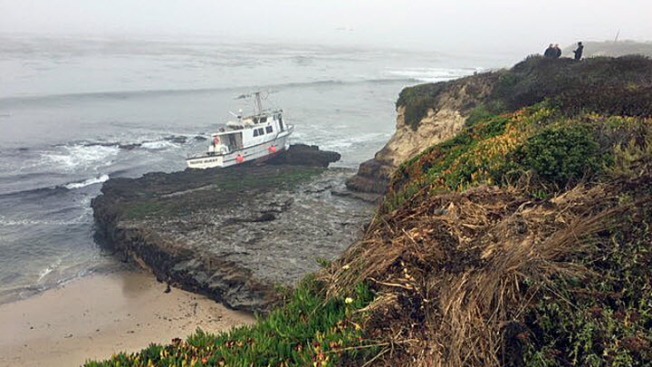 The 56-foot boat crashed at about 2 a.m. Sunday near Natural Bridges State Beach. The captain of the Pacific Quest and his dog were able to walk off the boat and didn't require any medical assistance, Coast Guard spokeswoman Sarah Wilson said. Crews were able to load 620 gallons of diesel to a vacuum truck before the tide rose, but they weren't able to recover the remaining 200 gallons, according to Wilson. She said diesel dissipates more easily than other fuels, and inspectors have not reported any rainbow sheen on the water. The Coast Guard is working with the National Oceanic and Atmospheric Administration to see where the diesel fuel will end up. There had not been any reports of impacted wildlife as of Monday afternoon. The boat is currently on shore and inspectors were expected to return to the area during the next low-tide cycle at about 5 p.m. to salvage what is left of the boat, according to Wilson. There are three batteries and some hydraulic fuel left on the vessel. "They were able to get quite a bit done this morning, so that's a good sign," Wilson said Monday, explaining that surf and rocks in the area can take quite a toll on boats. Mariners in the area have been asked to stay on the lookout for debris. There is no foot traffic in the area because it is not a publicly accessible beach, according to Wilson. The crash area is located between Natural Bridges State Park and the University of California at Santa Cruz Seymour Marine Discovery Center.